They may be called the Blues, but Conception Bay South and Paradise’s senior hockey team is red hot in East Coast Senior Hockey League play this year, sitting in first place at mid-season and quietly nursing hopes of making it to the Herder play-offs. If the CB Blues get there, they’ll face one of the rugged, semi-professional teams from the Central Newfoundland division that so far have battered and outgunned all others but the Blues in inter-divisional play. When the Blues and Grand Falls Cataracts met earlier this season, the Central squad edged the Blues 7-5, cementing the win with an empty-netter. The Blues will host the equally-skilled Gander Flyers at CBS Arena in February. “So far, so good,” Blues head coach and general manager Jonathan Kavanagh said Tuesday of his team’s performance. The Blues have played 11 games, winning eight, for 16 points. The Cataracts and Flyers are tied for second place with 14 points each. Clarenville is in fourth with 13 points. The Caribous are followed by the Southern Shore Breakers, St. John’s Caps and Northeast Eagles, respectively. The Blues have eight games left in their schedule with the next one not until Jan. 25. Kavanagh is hoping the players won’t be rusty after such a long break. The end of the season will see a road trip to Central. “The Central teams are still semi-professional hockey teams, still paying 100 per cent of their rosters, they’re operating with budgets probably 10 times the size of mine,” Kavanagh allowed. Because there are only two teams in Central, if the East Coast teams weren’t playing them in an interlocking format, those two teams probably wouldn’t have a league, Kavanagh said. The three team West Coast league, consisting of Corner Brook, Port aux Basques and Stephenville, are registered as Senior B teams, a notch down from this league and won’t be eligible to send a team to the Herder finals. The CB Blues are stronger than most of the other teams in their division so the contests against the Central teams are not as daunting. The Northeast Eagles, by contrast faced 81 shots and lost 8-2 when they tangled with the Cataracts last month. Like Hodge, Tibbo is a CBS native who played college hockey on the mainland. Tibbo was also a team leader in Junior A hockey on the mainland. 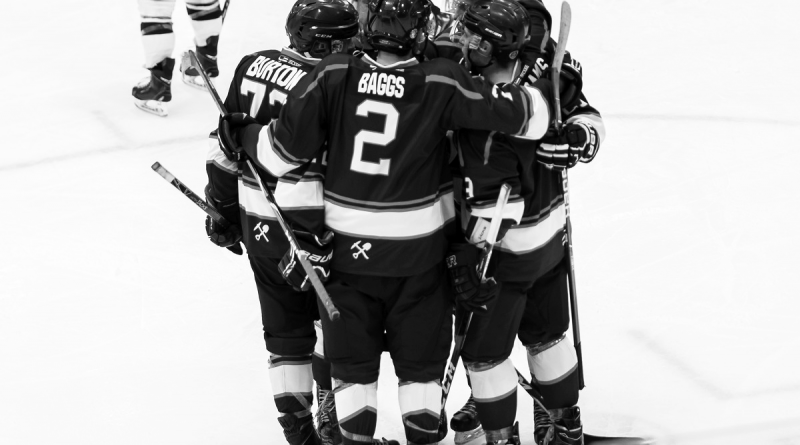 Defenseman Riley Baggs, also a CBS native, has mainland junior A experience too. It marks a big difference from last year, when at the start of the season the Blues had 12 rookies in the lineup. “This time last year we might have had two or three wins,” said Kavanagh. “However, I think in our last six regular season games we won five of them, so we came on towards the end of the year… And we’ve pretty much got all of our core guys back from last year and we were lucky enough to add Tibbo and Hodge, and Lush and Baggs. We basically took what was a solid core last year and improved it significantly with some young guys from CBS. Having played a close game against Grand Falls, Kavanagh said the Blues are looking forward to meeting Gander for the first time. “They’re supposed to be the favourite here,” he said.